Never have the highs and lows of racing been more evident than in this race at Mazda Raceway Laguna Seca. Ethan Low, driving the #37 JCW, started the race in 8th place after an amazing qualifying effort. Low immediately put the hammer down and was up to 6th within 15mins. He held steady at the front throughout his stint, driving up to as high as 4th position halfway through the race. After pitting to for tires, fuel, and a driver change the #37, now being driven by Mark Pombo, fell in a little further back in the field. Pombo was working the car back up through the field when the car got a flat right front with around 10 minutes to go in the race. In a hurry to replace the tire and get back on track Pombo experienced issues in the pits and at one point engaged reverse. Unfortunately this is against series rules and the #37 was parked for the remaind of the race; the officials even helping to push the car behind the wall. What started out as a very promising run for the #37 ended in disappointment. Meanwhile the #73 also had a promising start with Derek Jones behind the wheel. After beginning the race in 18th Jones quickly starting moving up the field, working his way up to 14th 15 minutes into the race. Unfortunately it was also around that time that Jones dropped the right sides off the track in a turn and upset the car, leading to a spin. Thankfully the other cars avoided him and he was able to get back underway quickly. At the midway point the #73 was up to 12th, and as high as 8th with one hour left to go. With Mat Pombo behind the wheel the #73 was holding steady in the top 10 until a full course caution with around 40 minutes to go brought the field back together. 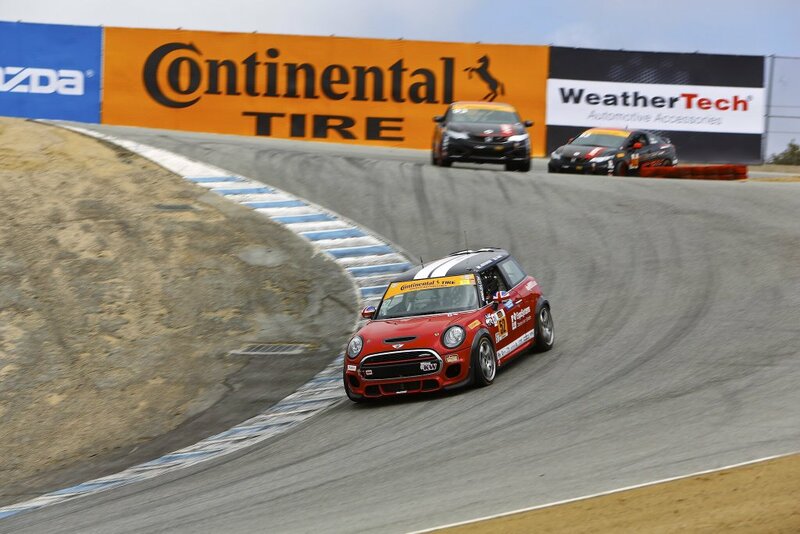 After the race resumed the #73 lost some positions but was still able to bring the JCW home with a respectable 14th place finish. T he #52 struggled to gain ground throughout the event. Ramin Abdolvahabi and James Vance held steady throughout the race after starting in the 23rd postion. About 40 minutes into the race their was contact with the #36 Porsche which sent the Porsche around. With 30 minutes left in the race they also had to serve a penalty. These incidents made it hard for them to improve on their position. In the end they were able to gain two positions on their qualifying spot, finishing in 21st. The final results are in the table below. To see results for the full field click here. It’ll be a long wait until round 4 of the Continental Tire SportsCar Challenge. The next race takes place at Watkins Glen International Raceway on July 2nd. After 2 straight DNFs the #37 will surely be anticipating getting back on track. Hopefully all three JCWs will put on a strong showing and bring MINIACS that heavily desired victory.